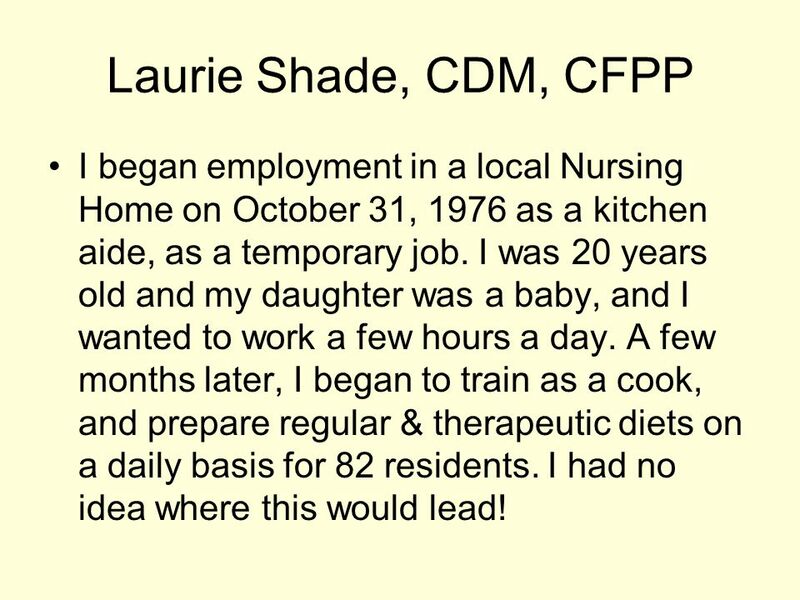 2 Laurie Shade, CDM, CFPP I began employment in a local Nursing Home on October 31, 1976 as a kitchen aide, as a temporary job. I was 20 years old and my daughter was a baby, and I wanted to work a few hours a day. A few months later, I began to train as a cook, and prepare regular & therapeutic diets on a daily basis for 82 residents. I had no idea where this would lead! 3 During the following months, cooking and serving the elderly residents was one of the most enjoyable jobs a person could have. 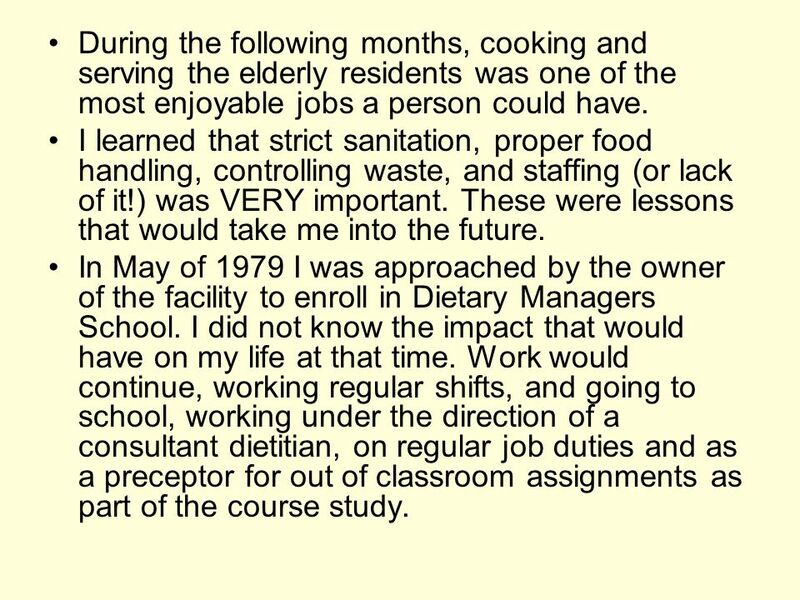 I learned that strict sanitation, proper food handling, controlling waste, and staffing (or lack of it!) was VERY important. These were lessons that would take me into the future. 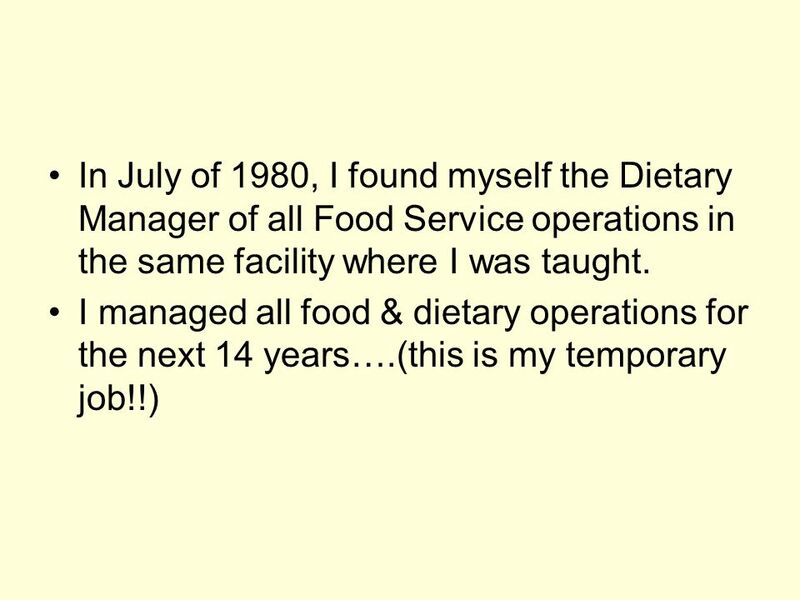 In May of 1979 I was approached by the owner of the facility to enroll in Dietary Managers School. I did not know the impact that would have on my life at that time. Work would continue, working regular shifts, and going to school, working under the direction of a consultant dietitian, on regular job duties and as a preceptor for out of classroom assignments as part of the course study. 4 In June of 1980, I graduated from Northeast Technology Center, Afton, OK. 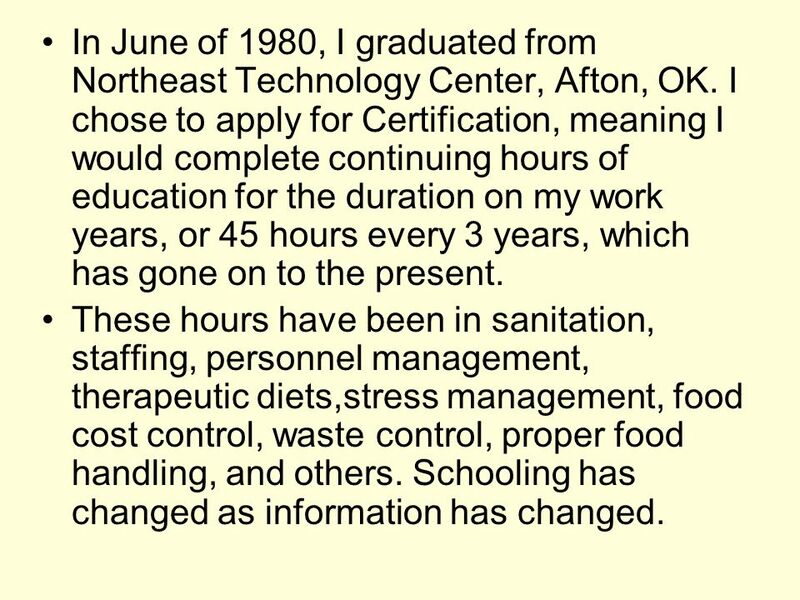 I chose to apply for Certification, meaning I would complete continuing hours of education for the duration on my work years, or 45 hours every 3 years, which has gone on to the present. These hours have been in sanitation, staffing, personnel management, therapeutic diets,stress management, food cost control, waste control, proper food handling, and others. Schooling has changed as information has changed. 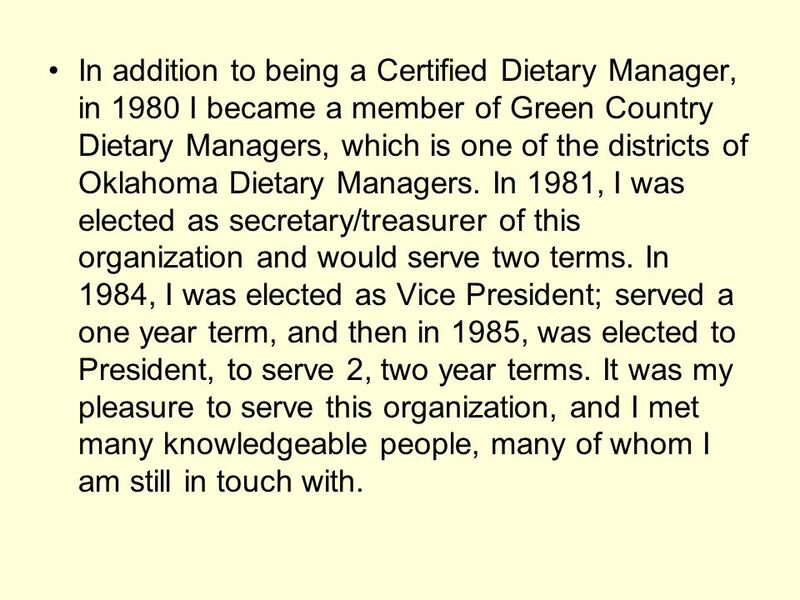 6 In addition to being a Certified Dietary Manager, in 1980 I became a member of Green Country Dietary Managers, which is one of the districts of Oklahoma Dietary Managers. In 1981, I was elected as secretary/treasurer of this organization and would serve two terms. In 1984, I was elected as Vice President; served a one year term, and then in 1985, was elected to President, to serve 2, two year terms. It was my pleasure to serve this organization, and I met many knowledgeable people, many of whom I am still in touch with. 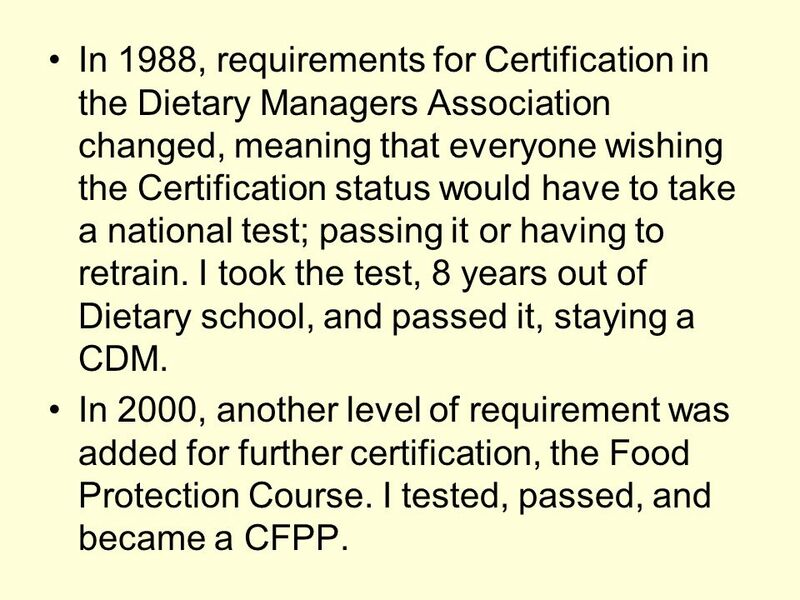 7 In 1988, requirements for Certification in the Dietary Managers Association changed, meaning that everyone wishing the Certification status would have to take a national test; passing it or having to retrain. I took the test, 8 years out of Dietary school, and passed it, staying a CDM. In 2000, another level of requirement was added for further certification, the Food Protection Course. I tested, passed, and became a CFPP. 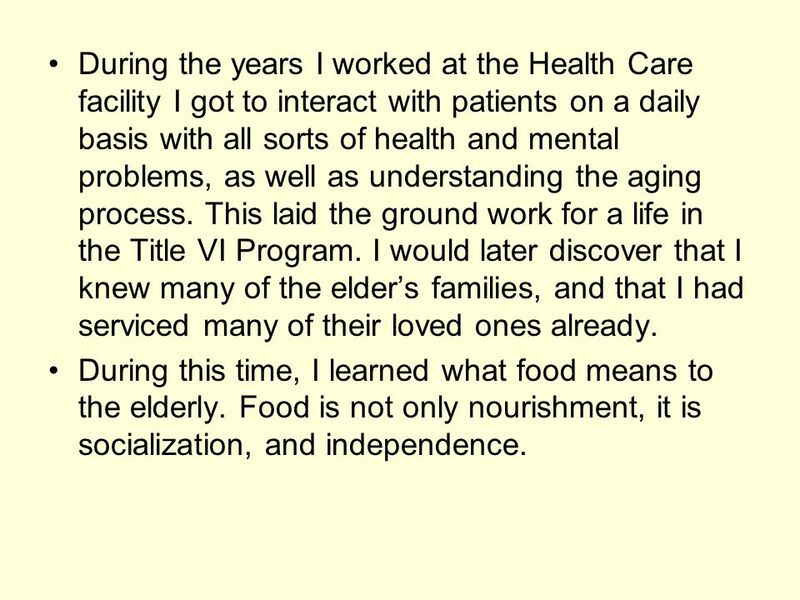 8 During the years I worked at the Health Care facility I got to interact with patients on a daily basis with all sorts of health and mental problems, as well as understanding the aging process. This laid the ground work for a life in the Title VI Program. I would later discover that I knew many of the elder’s families, and that I had serviced many of their loved ones already. During this time, I learned what food means to the elderly. Food is not only nourishment, it is socialization, and independence. 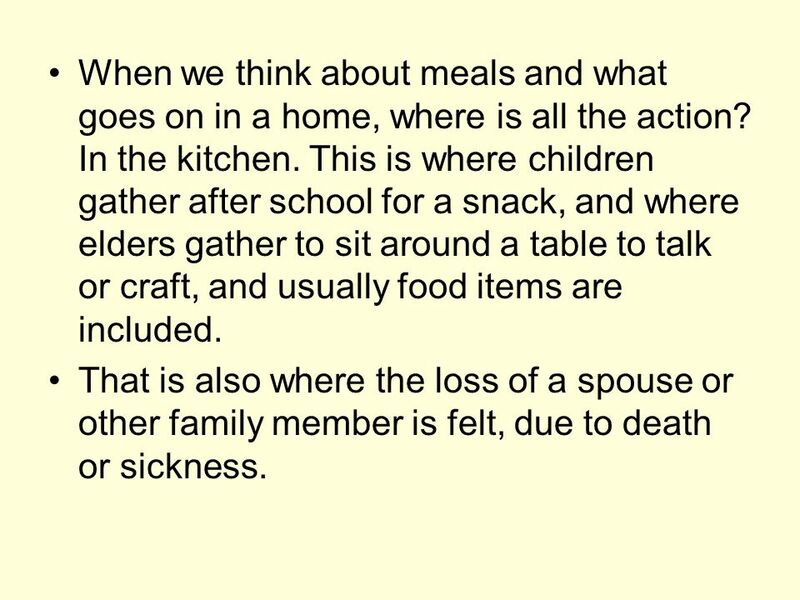 9 When we think about meals and what goes on in a home, where is all the action? In the kitchen. This is where children gather after school for a snack, and where elders gather to sit around a table to talk or craft, and usually food items are included. That is also where the loss of a spouse or other family member is felt, due to death or sickness. 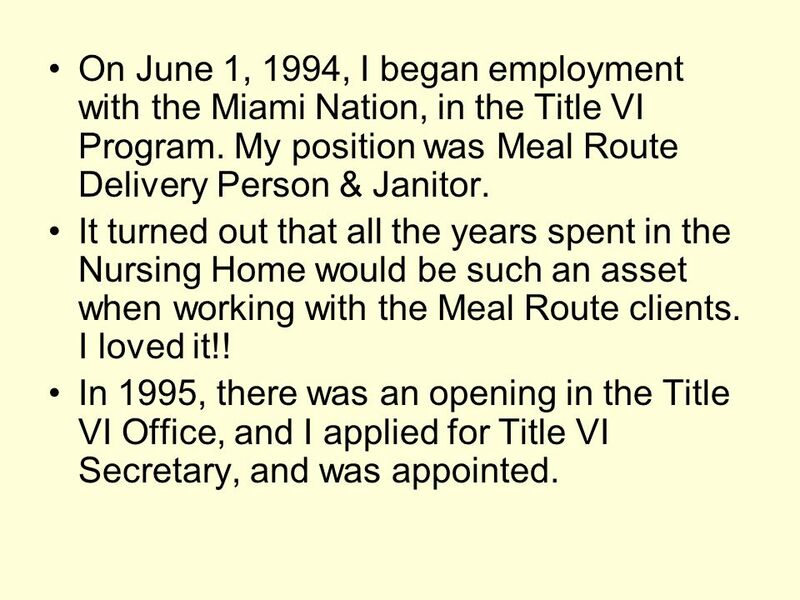 10 On June 1, 1994, I began employment with the Miami Nation, in the Title VI Program. My position was Meal Route Delivery Person & Janitor. It turned out that all the years spent in the Nursing Home would be such an asset when working with the Meal Route clients. I loved it!! In 1995, there was an opening in the Title VI Office, and I applied for Title VI Secretary, and was appointed. That is where the Title VI Program comes into play for the elders. We strive for our Nutrition Center at the Miami Nation to be a safe, neutral place. A place where elders feel at home, among friends, and where they like to come. 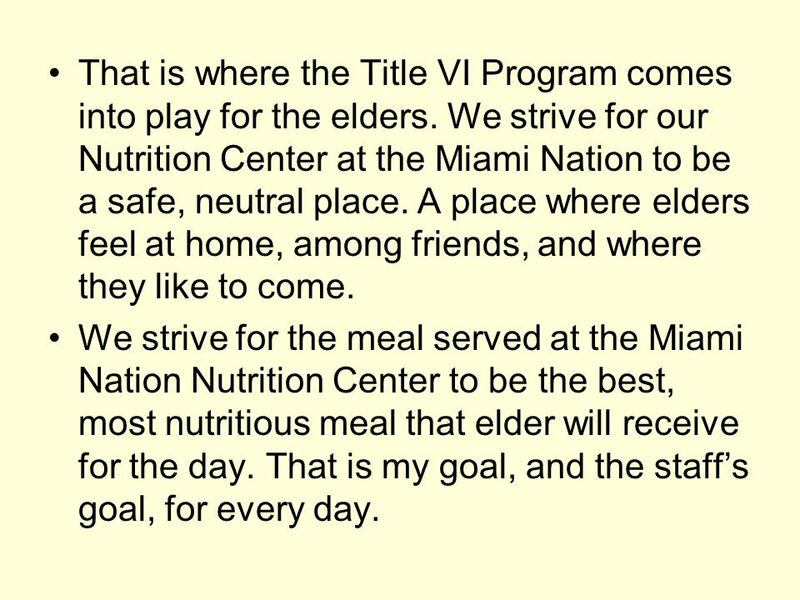 We strive for the meal served at the Miami Nation Nutrition Center to be the best, most nutritious meal that elder will receive for the day. That is my goal, and the staff’s goal, for every day. The Ottawa Tribe of Oklahoma, which contracts Part A & Part C services to us. The Peoria Tribe of Oklahoma, which contracts Part A services to us. I feel the success of the Miami Nation Title VI Program is their success also. It takes resources from all three to make this large program work. 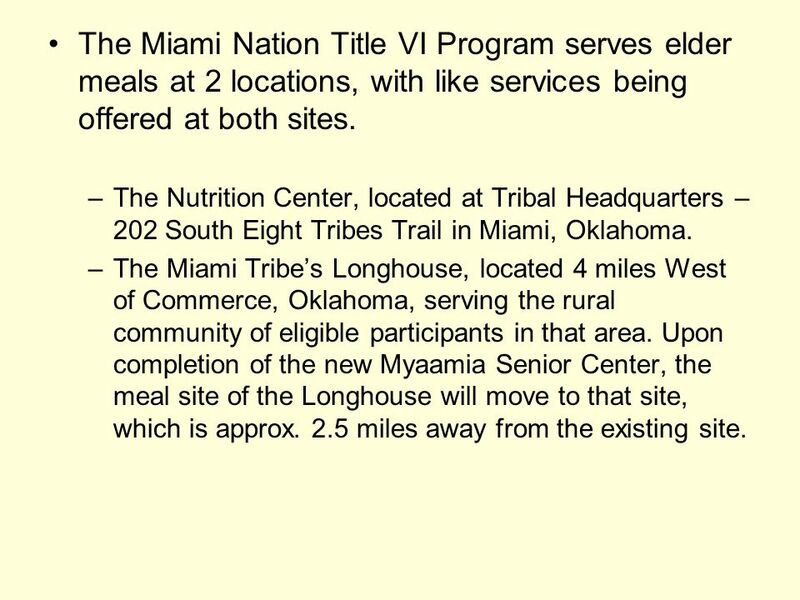 13 The Miami Nation Title VI Program serves elder meals at 2 locations, with like services being offered at both sites. The Nutrition Center, located at Tribal Headquarters – 202 South Eight Tribes Trail in Miami, Oklahoma. The Miami Tribe’s Longhouse, located 4 miles West of Commerce, Oklahoma, serving the rural community of eligible participants in that area. 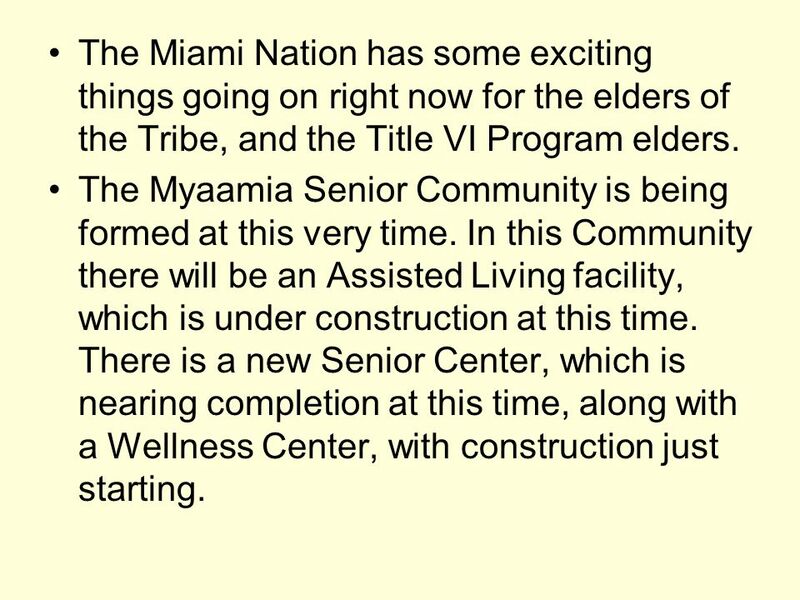 Upon completion of the new Myaamia Senior Center, the meal site of the Longhouse will move to that site, which is approx. 2.5 miles away from the existing site. 14 The Miami Nation has some exciting things going on right now for the elders of the Tribe, and the Title VI Program elders. The Myaamia Senior Community is being formed at this very time. In this Community there will be an Assisted Living facility, which is under construction at this time. There is a new Senior Center, which is nearing completion at this time, along with a Wellness Center, with construction just starting. 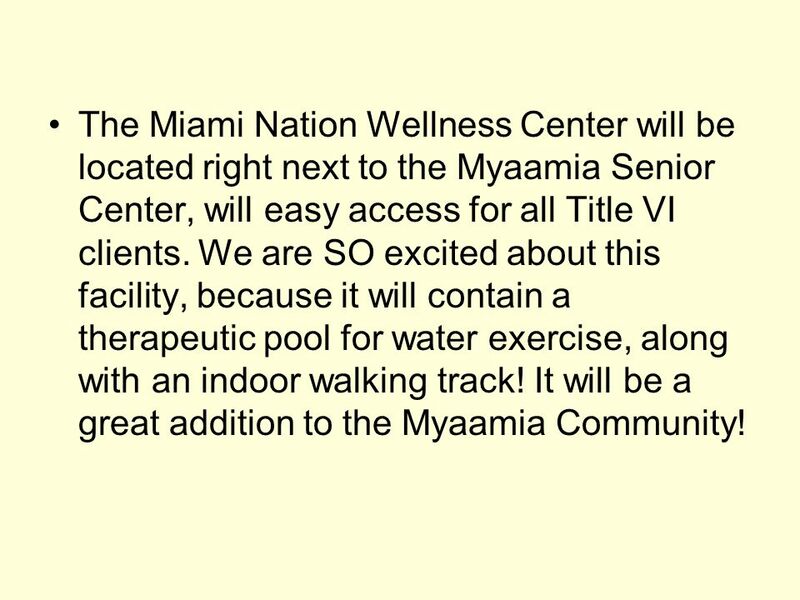 15 The Miami Nation Wellness Center will be located right next to the Myaamia Senior Center, will easy access for all Title VI clients. We are SO excited about this facility, because it will contain a therapeutic pool for water exercise, along with an indoor walking track! It will be a great addition to the Myaamia Community! 16 The Miami Nation has also received a grant from the Administration for Native Americans, to be used in conjunction with the Title VI Program. 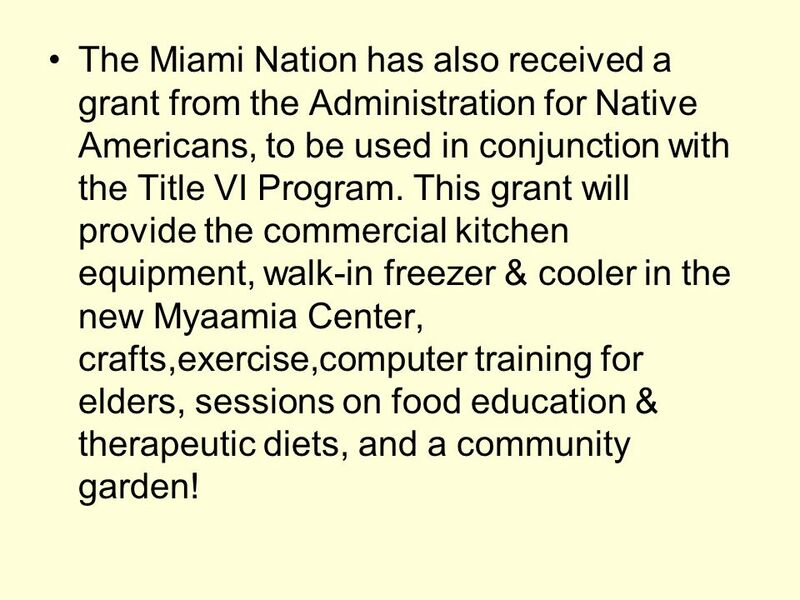 This grant will provide the commercial kitchen equipment, walk-in freezer & cooler in the new Myaamia Center, crafts,exercise,computer training for elders, sessions on food education & therapeutic diets, and a community garden! 17 Even after becoming the Secretary/Assistant Director, I chose to continue to run a Meal Route along with my normal duties. 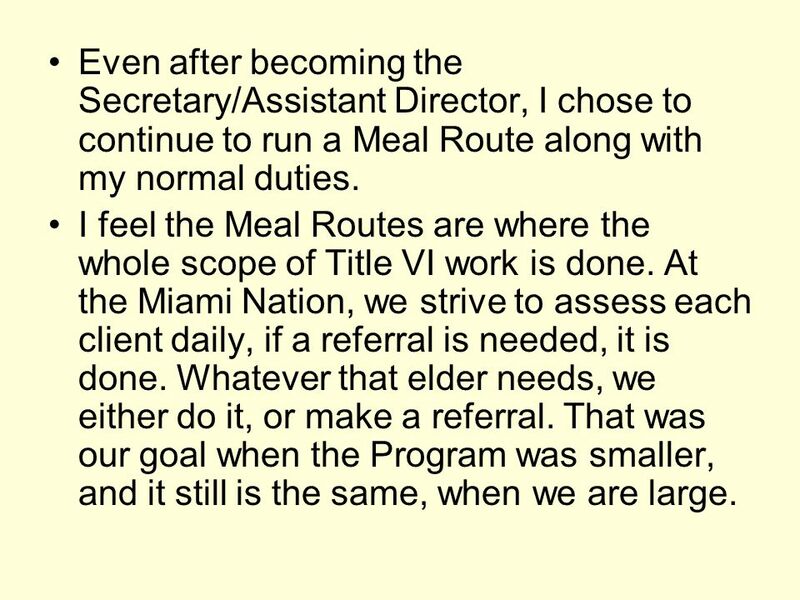 I feel the Meal Routes are where the whole scope of Title VI work is done. At the Miami Nation, we strive to assess each client daily, if a referral is needed, it is done. Whatever that elder needs, we either do it, or make a referral. That was our goal when the Program was smaller, and it still is the same, when we are large. 18 One of the lessons I learned working in a Nursing Home early on was what happens to the elderly that stay in the home past a time that it is safe for them to be alone. I would see them come in, undernourished, and neglected by their families in some cases. Some had been taken into custody by Adult Protective Services, for their own safety. 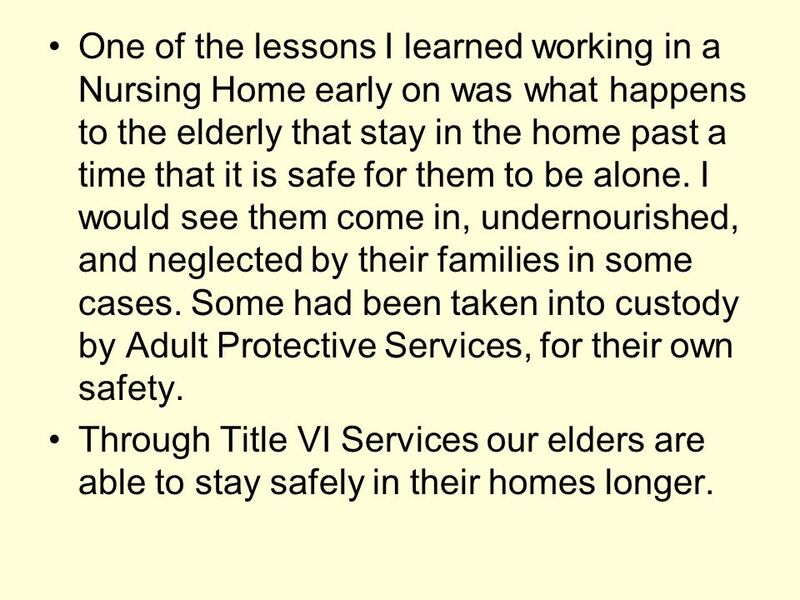 Through Title VI Services our elders are able to stay safely in their homes longer. 19 My official job title of Director of Community Services/Title VI Director allows me to coordinate services of the Title VI Program, Part A, the Caregiver Program, and the CHR Program. By being able to do this I feel we are able to do so much more for our elders. 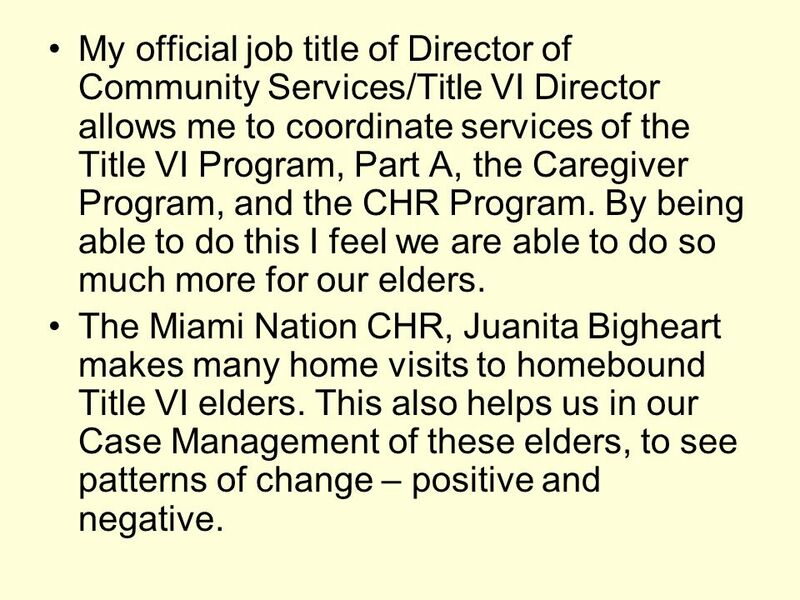 The Miami Nation CHR, Juanita Bigheart makes many home visits to homebound Title VI elders. This also helps us in our Case Management of these elders, to see patterns of change – positive and negative. 20 Many referrals have been made to see one’s physician due to in-home screening results. 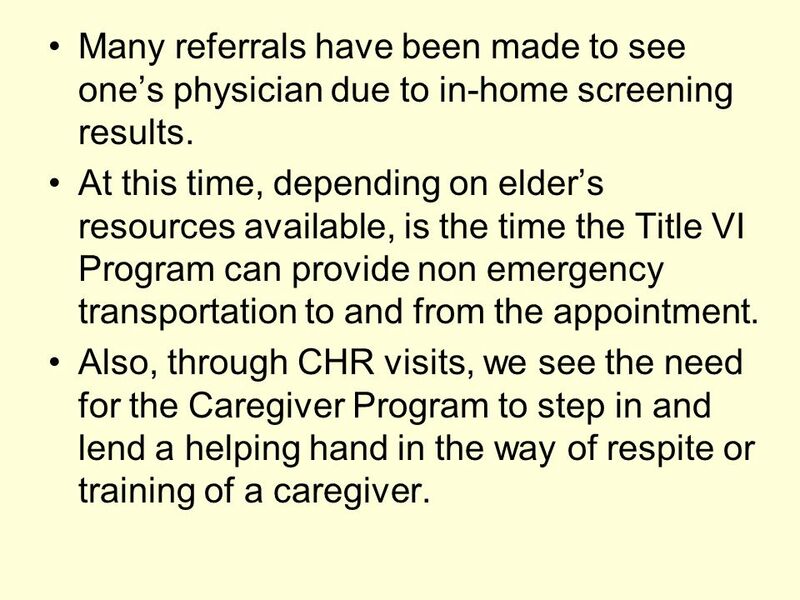 At this time, depending on elder’s resources available, is the time the Title VI Program can provide non emergency transportation to and from the appointment. Also, through CHR visits, we see the need for the Caregiver Program to step in and lend a helping hand in the way of respite or training of a caregiver. 21 As we are visiting homes, we are using a questionnaire for the elders, for our use only. 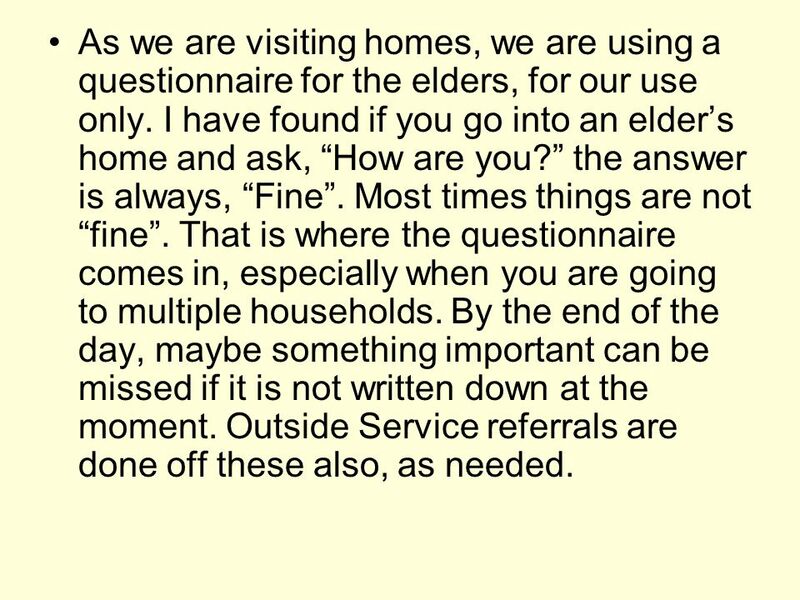 I have found if you go into an elder’s home and ask, “How are you?” the answer is always, “Fine”. Most times things are not “fine”. That is where the questionnaire comes in, especially when you are going to multiple households. By the end of the day, maybe something important can be missed if it is not written down at the moment. Outside Service referrals are done off these also, as needed. 22 As the Caregiver Program of the Title VI Program of the Miami Nation has grown, we have learned how to help our elders even more. 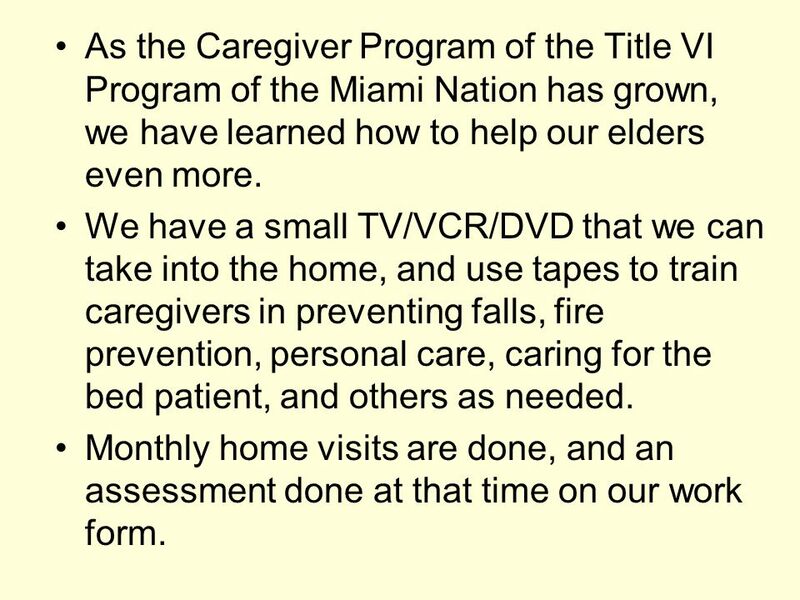 We have a small TV/VCR/DVD that we can take into the home, and use tapes to train caregivers in preventing falls, fire prevention, personal care, caring for the bed patient, and others as needed. Monthly home visits are done, and an assessment done at that time on our work form. 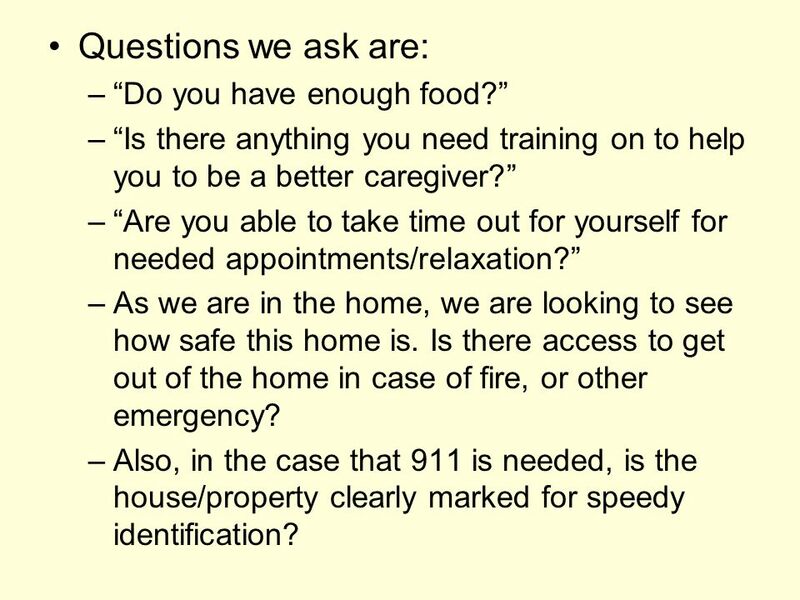 “Is there anything you need training on to help you to be a better caregiver?” “Are you able to take time out for yourself for needed appointments/relaxation?” As we are in the home, we are looking to see how safe this home is. Is there access to get out of the home in case of fire, or other emergency? Also, in the case that 911 is needed, is the house/property clearly marked for speedy identification? 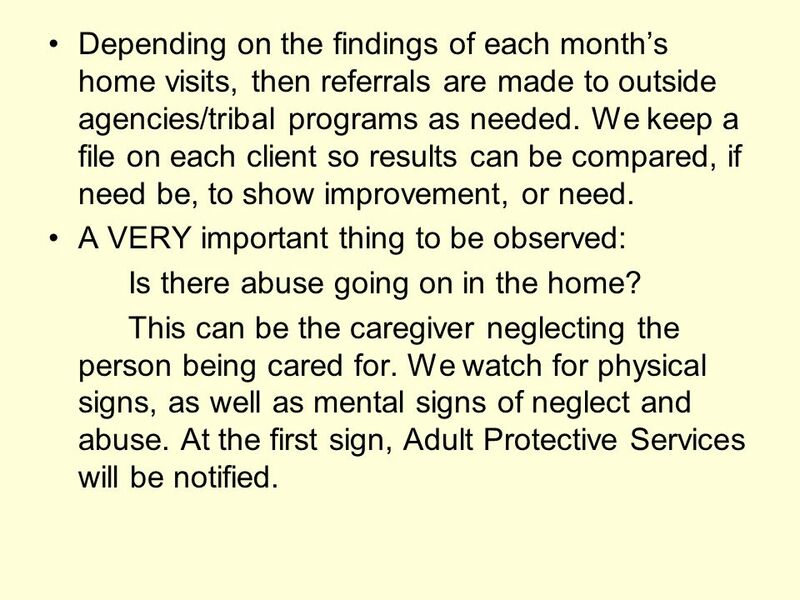 24 Depending on the findings of each month’s home visits, then referrals are made to outside agencies/tribal programs as needed. We keep a file on each client so results can be compared, if need be, to show improvement, or need. A VERY important thing to be observed: Is there abuse going on in the home? This can be the caregiver neglecting the person being cared for. We watch for physical signs, as well as mental signs of neglect and abuse. At the first sign, Adult Protective Services will be notified. 25 As in many cases of Alzheimer's, is the one being cared for abusing the caregiver? 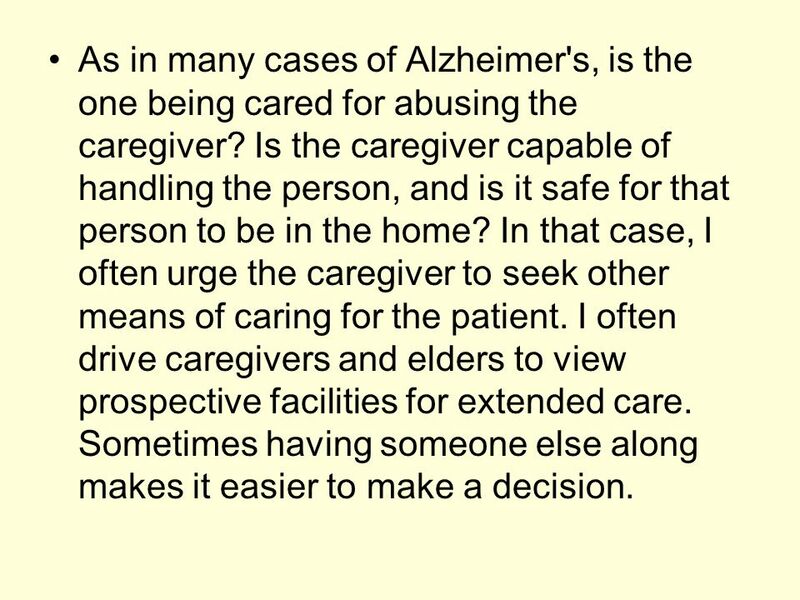 Is the caregiver capable of handling the person, and is it safe for that person to be in the home? In that case, I often urge the caregiver to seek other means of caring for the patient. I often drive caregivers and elders to view prospective facilities for extended care. Sometimes having someone else along makes it easier to make a decision. 26 We have found that dealing with APS is a very positive thing, in the way that change comes about. More times than not, there will be additional help available through DHS, in finding solutions to the problems. Many times through these home visits and assessments, we have helped caregivers and elders to solve problems. 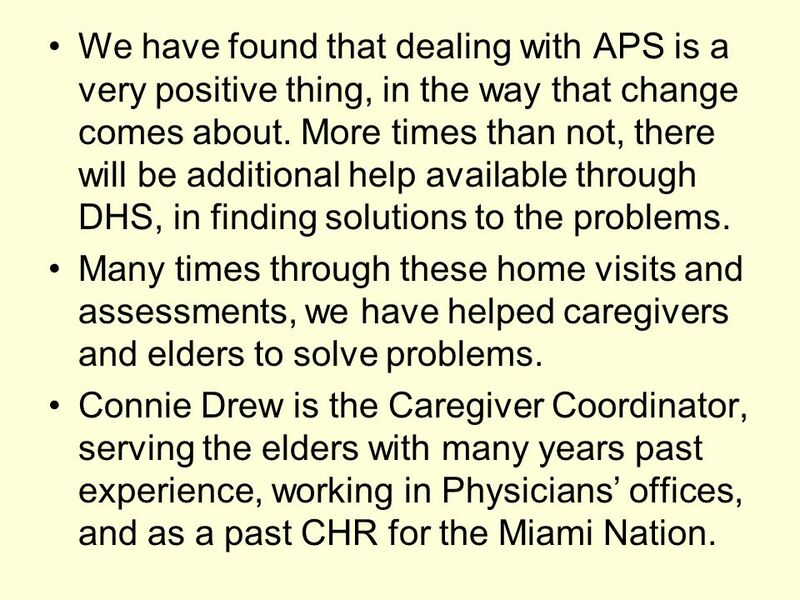 Connie Drew is the Caregiver Coordinator, serving the elders with many years past experience, working in Physicians’ offices, and as a past CHR for the Miami Nation. 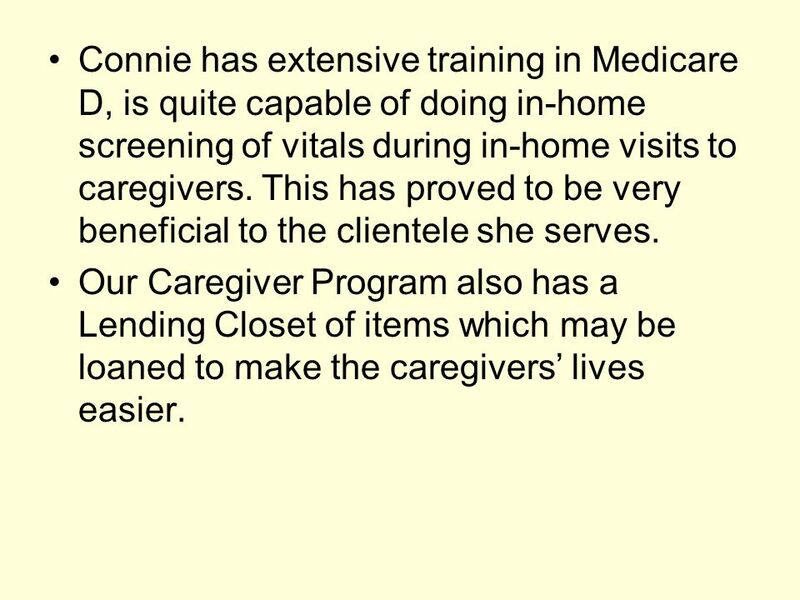 27 Connie has extensive training in Medicare D, is quite capable of doing in-home screening of vitals during in-home visits to caregivers. This has proved to be very beneficial to the clientele she serves. Our Caregiver Program also has a Lending Closet of items which may be loaned to make the caregivers’ lives easier. 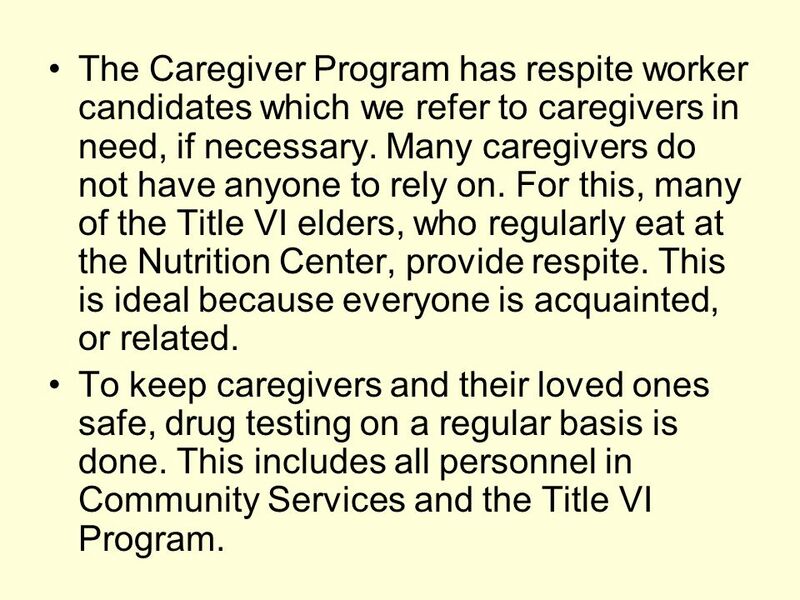 28 The Caregiver Program has respite worker candidates which we refer to caregivers in need, if necessary. Many caregivers do not have anyone to rely on. For this, many of the Title VI elders, who regularly eat at the Nutrition Center, provide respite. This is ideal because everyone is acquainted, or related. To keep caregivers and their loved ones safe, drug testing on a regular basis is done. This includes all personnel in Community Services and the Title VI Program. 29 At this time, I would like to tell you about my Assistant, Monte Shelton. Monte has worked with me for many years. We started out years ago, in the early 80’s, in the Nursing Home kitchen. She was a helper to me then, and now. 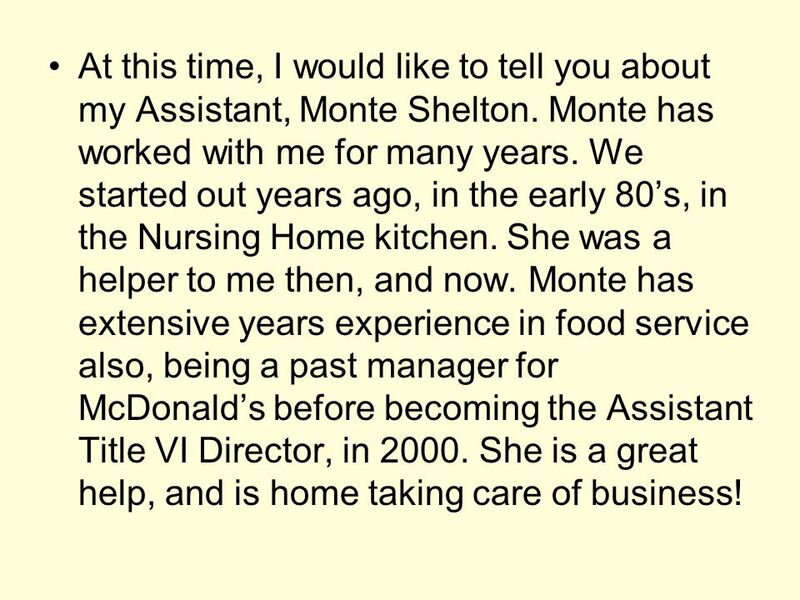 Monte has extensive years experience in food service also, being a past manager for McDonald’s before becoming the Assistant Title VI Director, in She is a great help, and is home taking care of business! I want to honor our kitchen staff. 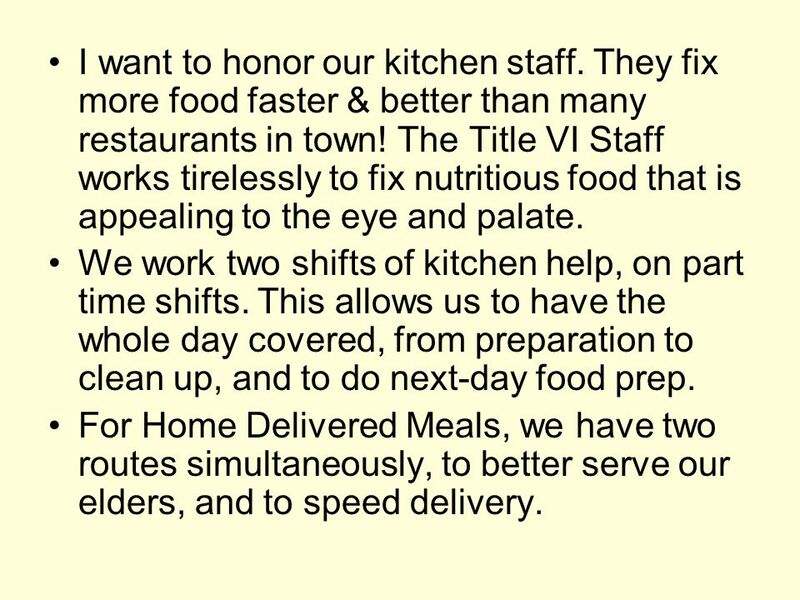 They fix more food faster & better than many restaurants in town! The Title VI Staff works tirelessly to fix nutritious food that is appealing to the eye and palate. We work two shifts of kitchen help, on part time shifts. This allows us to have the whole day covered, from preparation to clean up, and to do next-day food prep. For Home Delivered Meals, we have two routes simultaneously, to better serve our elders, and to speed delivery. 31 Thank you, very much. 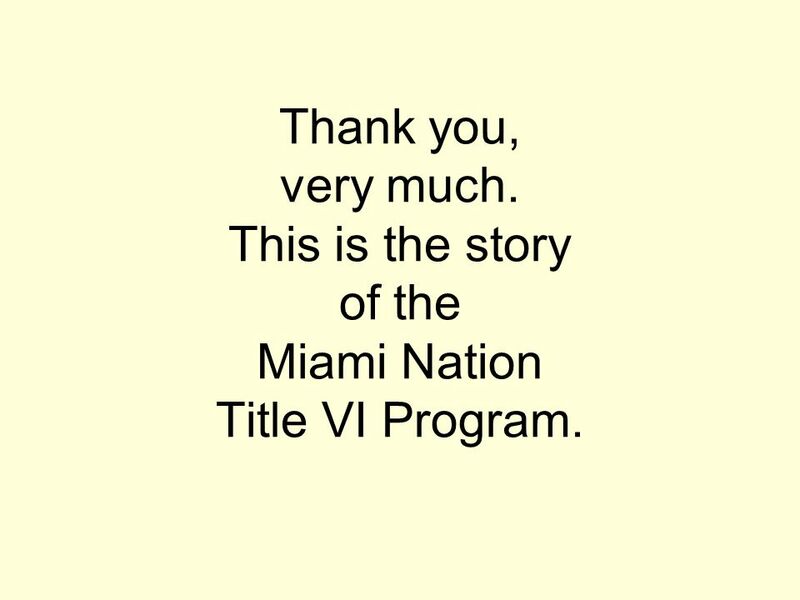 This is the story of the Miami Nation Title VI Program. 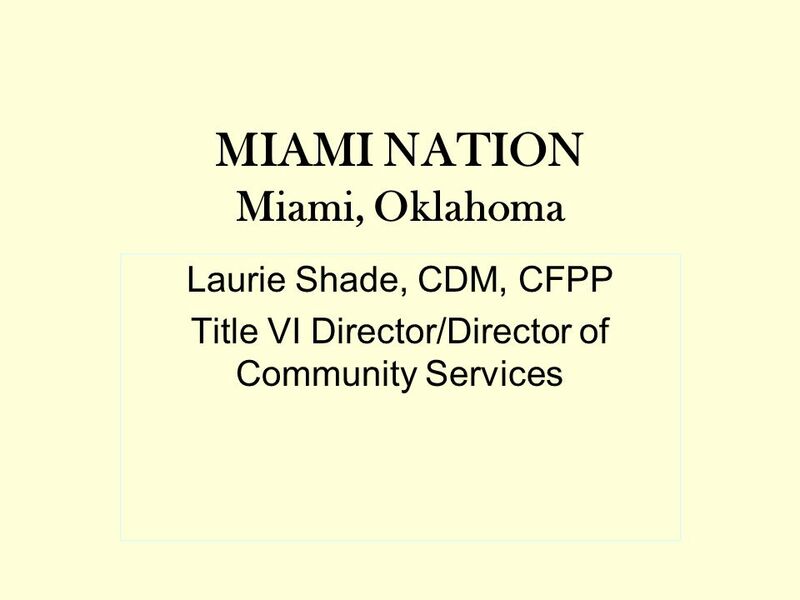 Download ppt "MIAMI NATION Miami, Oklahoma"
Providing Independent Living Support: Physical, Emotional, and Social Challenges Experienced by Clients Trainer:_______ Date: _______. Good Parenting Choices by Sholeh Dehghan (Bury CLAS) and Tameside EMAT Swahili translation by Magdaline Robinson. Resources and Information For Working Caregivers Sponsored by the Sussex County Board of Chosen Freeholders Provided by the Sussex County Division of Senior. CAREER ASSIGNMENT By Natosha Power & Trisha Taylor. Assalom u aleykum! This is how we say hello in Tajikistan. My name is Zulkada and I am an 11 year old girl living in southern Tajikistan. INTERVIEW CONDUCTED BY: ERIKA TAPIA Interviewing School Counselor: Norm Walker. BestChoiceHomeHealthCare.org BEST CHOICE HOME HEALTH CARE A Member of the Centerlight Health System Caring for New Yorkers for over 90 years, employing. Elderly Housing. Types of Housing  Assisted Living : Also called residential care, is a type of living arrangement in which personal care services such. 1 The World of Work Work: a useful, productive activity by which a person earns a living.